High Level Segment of the Conference on Disarmament, Palais de Nations, Geneva. 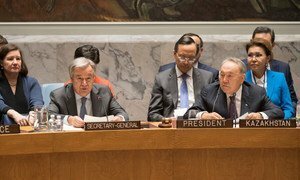 Warning that nuclear weapons pose catastrophic risks to human life and the environment, United Nations Secretary-General António Guterres on Monday called on the international community to make a reinvigorated push to rid the world of such weapons. “Countries persist in the mistaken idea that nuclear weapons make the world safer,” said the Secretary-General, addressing the UN Conference on Disarmament, in Geneva, Switzerland, on Monday. “At the global level, we must work together towards forging a new momentum on eliminating nuclear weapons,” he urged. Outlining a new initiative to give greater impetus and direction to the global disarmament agenda, Mr. Guterres said the world must respond to the dangers of the over-accumulation and proliferation of weapons, and reinforce the need to integrate disarmament into the UN efforts on preventive diplomacy and peacemaking. Side-by-side, a focus is needed on the impact of conventional weapons on civilians as well as on the link between disarmament and the 2030 Agenda for Sustainable Development, in particular the resources lost to excessive military spending – resources that could have been used to spur development activities. The UN chief also welcomed the completion of reductions by the United States and Russia under the New START Treaty (the Strategic Arms Reduction Treaty), and urged that the “courageous initiatives” taken by the Republic of Korea during the recent Pyeongchang 2018 Olympic Games be translated into lasting improvements, based on the central objective of the denuclearization of the Korean Peninsula and sustainable peace in the region. “We must work together towards our common goal: a world free of nuclear weapons,” underscored the Secretary-General. Speaking alongside Mr. Guterres, the President of the General Assembly, Miroslav Lajčák, stressed that Conference on Disarmament – which was established in 1979 but whose last decision was in 1996 – remains as critical as ever as the demand for disarmament has only risen, not fallen. “The Conference on Disarmament has been deadlocked since the agreement on the Comprehensive Test Ban Treaty, more than two decades ago,” he said. “We have to address this reality […] the Conference is the world’s foremost multilateralism forum on disarmament. It should be producing global frameworks and policies. It should be driving discussions and decisions, around the world. It should have the loudest voice of all,” he stressed. Currently, the consensus-based body focuses primarily on the following issues: cessation of the nuclear arms race and nuclear disarmament, prevention of nuclear war, including all related matters, prevention of an arms race in outer space and effective international arrangements to assure non-nuclear-weapon states against the use or threat of use of nuclear weapons. Worldwide concerns over nuclear weapons are the highest they have been since the Cold War, United Nations Secretary-General António Guterres said Thursday, calling for comprehensive political solutions that include dialogue and negotiation to prevent, mitigate and resolve conflicts.